Will Insurance Cover Tree Removal? 18 Sep Will Insurance Cover Tree Removal? Hurricane season is in full force. All it takes is one big storm to damage or topple a tree on your property. This can create a dangerous situation that often requires hiring a tree removal service to prepare your yard for a storm or clean up after one. One of the biggest question for most homeowners, in this case, is whether or not insurance will cover tree removal. The answer is, it all depends. Homeowners should begin by reviewing their individual policy. There are a number of factors that will determine if your insurance covers tree removal service. Will insurance pay for the removal of a tree that is still standing? Most insurance policies do not cover the removal of a standing tree. This holds true even if the tree is damaged or posing a potential hazard. It’s your responsibility as a homeowner to maintain the trees on your property. It’s important to always keep them pruned and trimmed to decrease the chance of them becoming a danger. If you’re aware of a tree that poses a risk, contact a tree removal service immediately. Failing to do so could result in your insurance company refusing to pay for the tree’s removal or any damage it causes. Keep in mind that you could also be liable if a tree from your property damages a neighboring home. Will insurance cover the removal of a fallen tree? It depends. Removing a tree in St. Augustine that is toppled by a storm but hasn’t caused damage isn’t typically covered by insurance. If that tree blocks your driveway or a handicap access, your policy may cover tree removal. Most insurance companies will cover the costs if a tree falls and damages your home or a structure. They also generally cover the removal of any tree debris under these circumstances. It’s important to note that there are limits as to what your insurance company will cover per storm. Your deductible must also generally be met before insurance pays for any damage. If your tree falls due to a storm or hurricane and damages a neighbor’s home, their homeowner’s insurance should pay for the damage. What do you do if a tree falls and causes damage? The first thing you should do if a fallen tree has caused damage is taken photographs. Next, contact your insurance company before removing any evidence. If it’s a dangerous situation, you’ll also want to contact the authorities. Don’t attempt to remove a large tree on your own. You’ll want to have a safety-certified tree removal service handle the situation. Tree removal service in St. Augustine in Jacksonville. Contact TREECO if a storm or hurricane has taken down a tree on your property. Safety is our number one priority. Our crew is professionally trained to complete all tree removals safely and efficiently. We also have the proper equipment to handle even the most difficult jobs. Our crews work day and night to service your property. 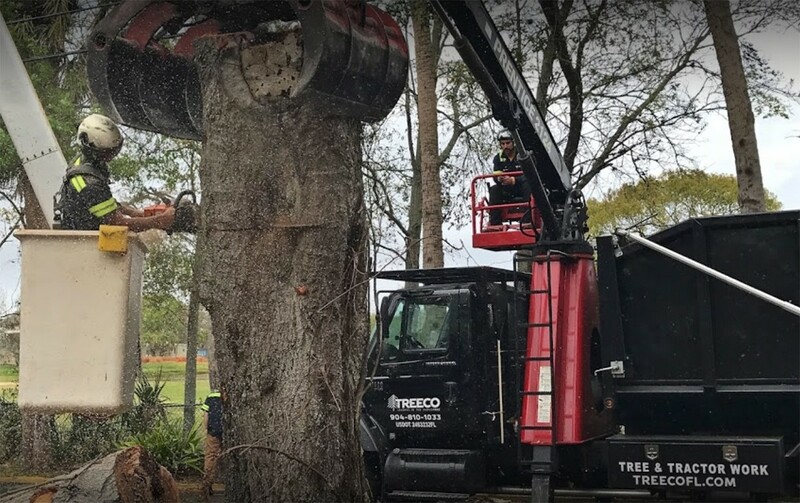 If you need emergency tree removal in the Jacksonville or St. Augustine areas, call TREECO at (904) 810-1033.